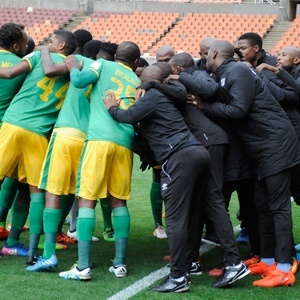 Cape Town - Baroka FC moved joint top of the Premiership standings after a 1-0 win over Free State Stars at the Peter Mokaba Stadium on Saturday afternoon. The first half provided good chances at both ends, although it was the home side who looked the more likely team to score. The second half was a tighter affair, but the hosts stepped up their game in the final 15 minutes to score what was arguably a deserved winner. The first clear chance of the game fell to Baroka striker Lucky Nguzana on 17 minutes, but having gone clear through on goal, he steered his parting shot wide of the target. Stars were to have a couple of chances half-way through the stanza, including Nhlanhla Vilakazi's well-hit effort from distance which was close to finding the top corner. After a grass-cutter from Bakgaga midfielder Sipho Moeti was saved by Stars keeper Badra Sangare, the visiting side nearly scored from a blistering counter-attack three minutes before halftime, but home keeper Virgil Vries did well to steal the ball off Sinethemba Jantjie's feet. There was an early chance just after halftime for the Limpopo team, but Nguzana's shot flew well over the crossbar. Both teams struggled to create openings and it was only in the 76th minute that the next goalmouth action took place when Gift Motupa fired just wide from a near-post cross for the home side. Baroka were denied what looked a clear penalty two minutes later after Bangali Keita clipped Moeti, but the referee saw the incident differently. But the home side had their reward in the 85th minute when Mpho Kgaswane's shot from the left-hand side took a deflection before hitting the back of the net. Nguzana missed a chance right in front of goal two minutes later, but it proved immaterial as Bakgaga held on to make it eight points from their opening four league matches this season.